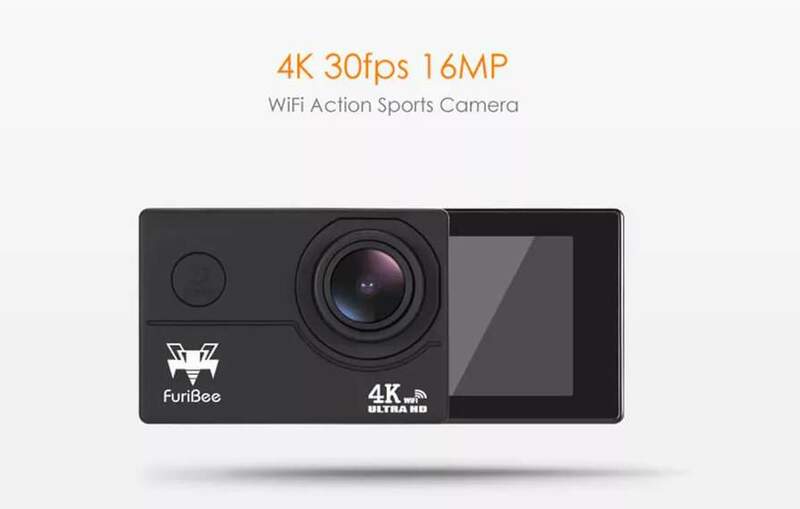 This actually looks like a decent cam for the money, reviews are very positive and YT link below shows someone using the cam with a drone - also includes a waterproof case. Not saying it going to me mind-blowing but for £15 should be alright. 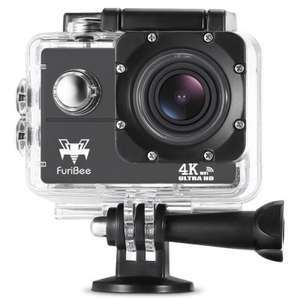 The FuriBee F60 4K action camera is able to produce ultra high-definition and smooth videos. With the 170 degrees lens, it can retain more realistic scene and captures more immersive videos and photos. 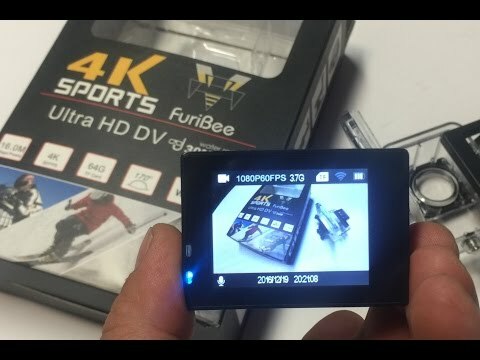 The equipped Allwinner V3 chipset will provide you with 4K 30fps ( 3840 x 2160 ) video resolution. What is more, it comes with a 30m waterproof case which allows you to capture photos and videos underwater. It's' an SJCam copy, possibly an SJCam itself rebranded. Frankly, I would not waste your money. It could be compelte crap. Your best bet in buying cameras like these from China is to look at YouTube reviews of cameras by users like TechMoan and pay a little more. I would ignore some of the lesser known reviewers on YouTube as some are in the pockets of companies like GearBest. At least you know with users like TechMoan that he'll be relatively impartial even if they give him a free camera. It's' an SJCam copy, possibly an SJCam itself rebranded. Frankly, I would …It's' an SJCam copy, possibly an SJCam itself rebranded. Frankly, I would not waste your money. It could be compelte crap. Your best bet in buying cameras like these from China is to look at YouTube reviews of cameras by users like TechMoan and pay a little more.I would ignore some of the lesser known reviewers on YouTube as some are in the pockets of companies like GearBest. At least you know with users like TechMoan that he'll be relatively impartial even if they give him a free camera. Just ordered one, ideal for messing about with a drone . Got one of these for £20 a few weeks ago. If you’re not a professional photographer, it should be fine for your needs. I got it mainly for my daughters to mess about with snorkelling next year. We’ll see what happens. They're on here because of all the money they bring in for HotUKDeals. Forget safety standards, product quality, warranties and the dodgy environmental and working standards in relation to the products they sell, etc etc. As long as they bring in lots of money for HotUKDeals they will be allowed on here. I’ve seen these cheap 4k 30 FPS cams for as low as £25, but £16 is ridiculously cheap. They're on here because of all the money they bring in for HotUKDeals. …They're on here because of all the money they bring in for HotUKDeals. Forget safety standards, product quality, warranties and the dodgy environmental and working standards in relation to the products they sell, etc etc. As long as they bring in lots of money for HotUKDeals they will be allowed on here. I'll take the pizza, thanks. It'll last longer. is the explorer pro 2 newer than the explorer pro? sorry if silly question.